Prosthetic Records’ Holy Grail released earlier this year an album that stands nearly halfway through 2013 as the best new metal record of the year. 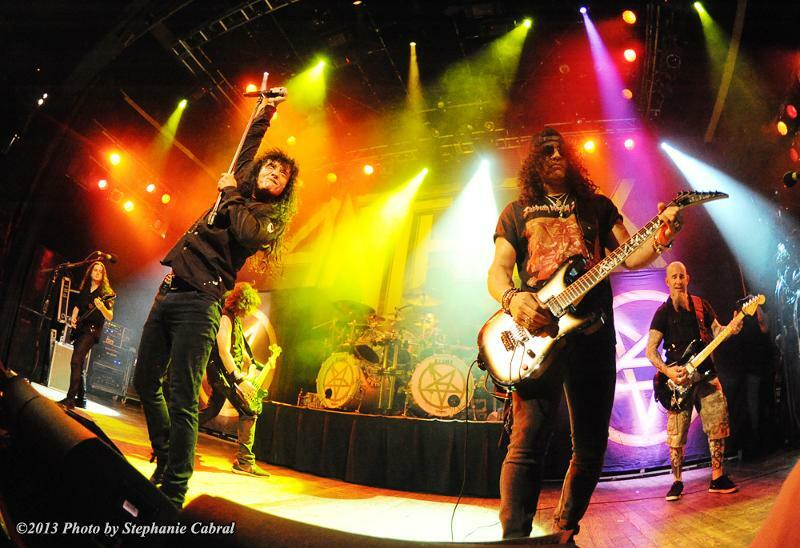 The band also recently finished up a tour stint with Anthrax on the band’s “Metal Alliance” tour. Now, the band has released the video for the latest single from its new album. The band’s latest single is the title track from said album, Ride The Void. The video for the new single can be viewed now on YouTube at http://www.youtube.com/watch?v=VzXtHJcC5I0&feature=youtube_gdata_player. It’s fitting that this new single has been released fresh on the heels of one tour and in the midst of another. The video for the single presents to viewers what a live Holy Grail set looks like. It was directed by Will Knapp. 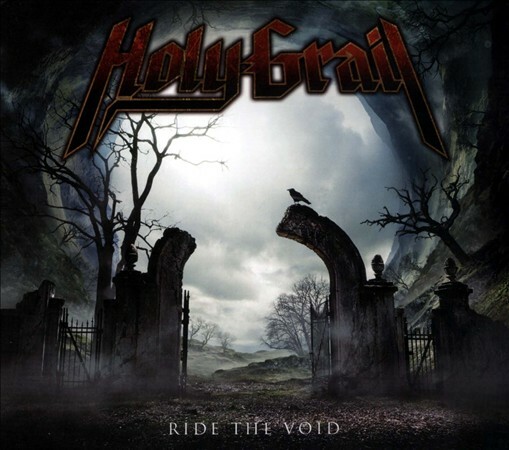 Holy Grail is touring alongside Exodus right now, making its way to the West Coast. It will be in Billings, MT tonight and at L.A.’s famed Viper Room on May 15th. That show will be without Exodus. Fans can find out about all the band’s latest tour dates and news when they “Like” the band on Facebook at http://www.facebook.com/holygrailofficial. Anthrax has proven once again with its new EP, Anthems, why it is still one of rock’s elite bands. This veteran rock act has crafted in its new release a work that is perfect in every way. From the sequencing to the sound to the very packaging, everything that could have been done right was done right. Sure, it probably is essentially a space filler between albums, but even if that is the case, it is one heck of a space filler. It’s a musical history lesson for rockers of all ages. Here, audiences get a band that by comparison to the bands it covers is relatively young. Yet it shows that it knows the classics through some expert renditions of said classics. Anthems opens with a cover of Rush’s ‘Anthem.’ This song originally appeared on Rush’s album, Fly By Night. That Anthrax would cover Rush is a mind blower in and of itself. Considering the style of music for which Anthrax is known, one would not instantly consider such a polar opposite sound to be any kind of influence on the band. So that in itself is an eye opener. That the band so expertly covered the song is even more of an eye opener. The band paid homage to Rush and the song with its cover, but still added its own touch to the song, too. Front man Joey Belladonna makes the song even more solid of an opener when he sings the line, “Welcome to the world.” When Geddy Lee first sang those words, they obviously had their own meaning. But having Belladonna sing those same words, they somehow take on a whole new meaning. Since this is the EP’s opener, it could be argued that those words take on an introductory fashion for new listeners and a whole new introduction even for those more seasoned audiences. Given, that probably wasn’t the intended function of that line. But it does seem to have that impact. The band’s new EP only gets better from the opening cover. The EP’s second track is a cover of another legendary band’s song. The band’s cover of AC/DC’s ‘TNT’ is without a doubt, one of this disc’s major high points. 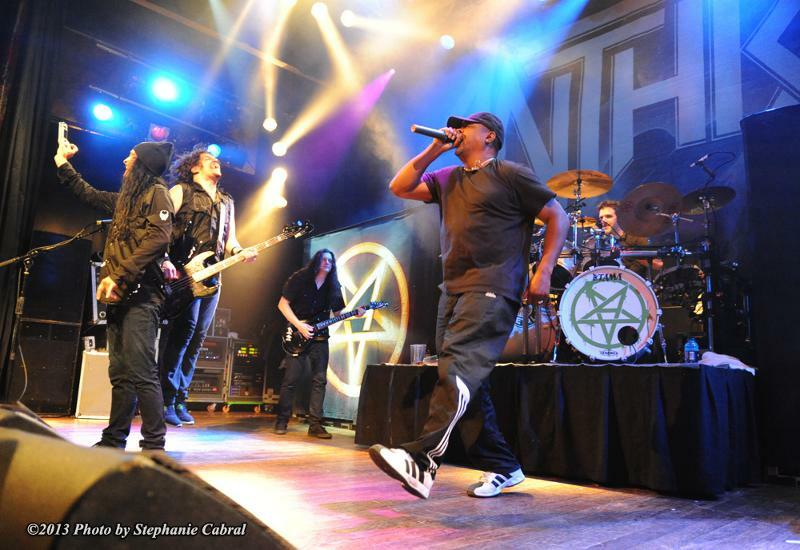 One can’t help but focus yet again on front man Joey Belladonna. Maybe it is just this critic’s own take on the song, but Belladonna sounds eerily like the late great Bon Scott in every sense in this song. Had one not known it was him, one might actually have thought it was the original song. This is also thanks in part to guitarist Rob Caggiano, who earlier this year announced his departure from the band. His take on Angus Young’s guitar work on this rock classic pays Young full honor. And drummer Charlie Benante’s drumming is just as solid as that of Phil Rudd. This is one that one could easily see the band performing live as it tours the country on the Metal Alliance Tour this Spring. If Anthrax’s covers of ‘TNT’ and ‘Anthem’ aren’t enough for fans, then the cover of Boston’s ‘Smokin’’ will impress audiences. This is yet another spot on cover that keeps the energy flowing from the EP’s first two tracks. Older, more experienced rockers will love how the band handles this track. And that such a young band by comparison could so expertly handle this classic will make older audiences smile, too. Younger audiences will love it too simply because the band shines here even more. It’s as if the band just keeps getting better and better on every track. This is the case with the remaining trio of covers included here, too. Those covers lead into the inclusion of two more bonuses in the form of ‘Crawl’ and its remix of sorts. ‘Crawl’ was taken from the band’s 2011 album, Worship Music. Including both this track and its remix was actually quite smart. Whereas so many bands in a case such as this would only include the redone track or live track, Anthrax and Megaforce Records have included both tracks, thus offering audiences the chance to compare and decide for themselves which version of the song they like better. Regardless of which song becomes one fan’s favorite or another’s these last two tracks help the EP close just as solidly as it opened. It goes without saying that if any one negative that could be said about Anthems, it is that the band chose to make this an EP, instead of a full length album. Here’s to hoping one day, fans will see that happen. Until then, fans can listen to his EP to their hearts’ content as the EP is available now both in stores and online. It can be ordered online direct from the official Anthrax website here: http://anthrax.com/2013/03/19/anthems-is-here/. Worship Music can be ordered directly via the band’s official website also at http://shop.anthrax.com/shop.cfm/pk/category/ac/detail/cid/409267/prodid/412162. Fans can get a chance to win a copy of Anthems for free right now and the chance to see the band live at its stop in Charlotte, North Carolina next month from the Phil’s Picks blog and Facebook page when they “Like” the Phil’s Picks Facebook page at http://www.facebook.com/philspicks. Just “Like” the Phil’s Picks Facebook page and say you want to be entered for the chance to win an EP and to see the band live. The Phil’s Picks blog keeps rolling in 2013 with lots more giveaways. I’m proud to announce that I have LOADS of new giveaways this coming week. First up, I’ve got three (3) copies of Anthony Hopkins’ new movie, Hitchcock on Blu-ray/DVD/Digital combo pack to give away. I’ll give away these copies Monday, Tuesday, and Wednesday March 25th, 26th, and 27th. The first person to get five (5) people to “Like” the Phil’s Picks Facebook page each day will win their own copy of this brand new release. Each person that “likes” the Phil’s Picks Facebook page has to either message me or post on the Phil’s Picks Facebook page timeline letting me know who sent them so that I can keep track of each person’s entries. The second of the week’s contests will be drawings for copies of the brand new Digimon Adventure: Volume 2. I’ll draw three lucky winners’ names Tuesday, Wednesday, and Thursday. Just “Like” the Phil’s Picks Facebook page to get your name in for this drawing. On Friday, one lucky person will win a copy of Digimon: The Complete Season 2 for themselves. Again, this is a straight up drawing. You can enter simply by posting on the Phil’s Picks FB page’s timeline or messaging me via the Phil’s Picks FB page. I have a third contest for all the parents next week. One lucky parent will win Scholastic’s brand new triple disc set, Scholastic Storybook Treasures Spring Collection. I also be giving away that box set on Thursday, March 28th. The process is the same as above. Simply either message me or post on my timeline letting me know that you want in on this drawing. And last, to cap off this coming busy week, I’ve got one more HUGE giveaway for my brothers and sisters in the Metal Nation worldwide. On Thursday, March 28th, I’ll be giving away a copy of Anthrax’s new EP, Anthems. One person will take home this disc. And then finally on Friday, March 29th, I’ll draw the name of one person who will win not just the new Anthrax EP, but also a pair of tickets to see Anthrax when the band headlines the Metal Alliance Tour at its stop in Charlotte, North Carolina on the Metal Alliance tour. Again it’s a drawing, nothing more. So make sure that you start getting your name in ASAP if you want to have the chance to win. If any of this confuses you, just message me and let me know via the Phil’s Picks Facebook page at http://www.facebook.com/philspicks. You can’t enter unless you “Like” the Phil’s Picks Facebook page first. So get out there, get the word out, and get your name in! To keep up with the latest sports and entertainment news, reviews, and giveaways, go online to http://www.facebook.com/philspicks and “Like” it. Fans can always keep up with the latest sports and entertainment news, reviews, and giveaways in the Phil’s Picks blog at https://philspicks.wordpress.com.